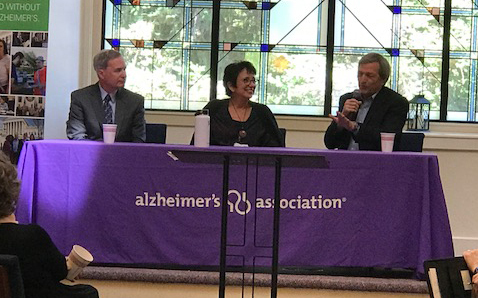 On August 1st, Congressman DeSaulnier addressed a crowd of more than 100 Contra Costa County constituents. He expressed the need for improvements in America’s long-term care and caregiver support systems. The topic is personal for him, his 95 year old mother was diagnosed with dementia ten years ago. In 2015, Congressman DeSaulnier was diagnosed with chronic lymphocytic leukemia, a treatable but incurable form of the disease. Due to his experience managing his own long term treatment, he understands the importance of palliative care and accessible healthcare for Americans. Palliative care is a team-based approach that focuses on relieving symptoms, stress and supporting the best possible quality of life for patients, caregivers and their families. As the demand for palliative care grows, more must be done to ensure an adequately trained workforce. The Palliative Care and Hospice Education and Training Act (PCHETA) would increase palliative care and hospice training for healthcare professionals, inform patients and families about the benefits of palliative care, and enhance research on improving the delivery of palliative care. To learn more about palliative care please visit alz.org/pcheta.